Design Inc has just completed a new Tiger helicopter advertising campaign for long term client Airbus Helicopters. 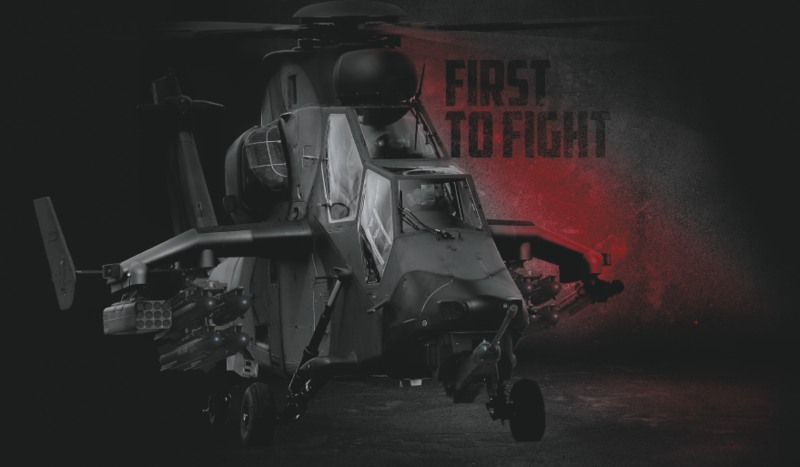 We were asked to provide creative concepts for a new Tiger helicopter campaign for a new tactical campaign to support Airbus Helicopters bid to win a major rearmament contract for the Polish Army. The Tiger attack helicopter is pictured against a patriotic Polish background and supported by ‘Make In Poland’ as the Tiger helicopters would indeed be made in Poland. The First To Fight poster references Poland’s experience in WWII, whereas the claw-scratched page is based on the colours of the national Polish flag. Originally requiring only a single advert, two different treatments were actually selected from a number of original ideas presented. Both the chosen Tiger helicopters adverts were a diversion from our usual and long-established corporate campaign. This genre challenging campaign is a play on scale, featuring Airbus Helicopters models pictured in juxtaposition with a ‘prop’ that represents the mission. For example a fountain pen nib for ‘business’, a petrol pump nozzle for ‘oil and gas’, a medical kit for ‘medivac’, a flashing blue police car light for ‘homeland security’ and others.